Yes! It was only a matter of time but one of my personal favourites while growing up has a kid is now the Game of the Month; the very first Mega Man game. How can I not name this Game of the Month, eh? It's a true video game legend and is quite rare now of days. The series has become very popular over the years and has you can see all from the many Mega Man games listed below (I may of forgot some them though) sure, some of the games may have not changed much over the years but you really can't go wrong with a good Mega Man game. There are only 6 robots in the first Mega Man, not the usual 8. 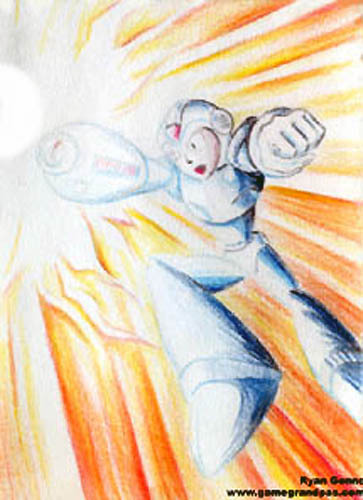 The first Mega Man is famous for having some of the worst artwork on a game box ever. "The guy on the front looks like he has to go to the bathroom or something, come on, I could do better art than that!" If you got past the horrible artwork though you'll find a cool little action packed game that will challenge even the most seasoned player. You play as Mega Man, and you're the only one who can stop your creator's (Dr. Light) 6 other robots that have gone berserk and are destroying the city. Dr. Wily was once Dr. Light's partner but Wily's experiments were too controversial and he was brandish from the scientific community. Now he wants revenge on the city of megalopolis and Dr. Light. Dr. Wily gets control of Cut Man, Guts Man, Elec Man, Bomb Man, Fire Man, and Ice Man to lead a planned attack to reek havoc, only Mega Man can stop em now. The robots stages all have a theme to them like the Ice Man stage is in a winter hideout filled with icy floors and floating platforms, the GutsMan stage is a construction area and the robots there are not too happy to see you, the Bomb Man stage is part of a high raise city, Fire Man's stage takes part in a active factory, the Cut Man stage is filled with several flying enemies in a downtown area, and finally the Elec Man stage takes place in a dangerous electric power plant. Each one has a stage filled with all kinds of traps and robots but if you manage to make it half way or near the end and you die then you can continue the level as long as you have enough lives left. The game also you select from any robot stage you want too and you have to love that but after you finish off the 6 robots, you're on your own. Once you defeat one of the six robots Mega Man has the ability to steal their weapon like Guts Man's strength and Bomb Man's Bomb. No other game has done this before and it made the game more playable because some weapons work better than others in certain areas like Cut Man's Blade will kill Elec Man in just three hits and Bomb Man's bombs will destroy smaller enemies that your normal weapon wouldn't. After all the 6 robots are defeated you'll finally get a chance to get the guy who is behind this whole mess, the evil Dr. Wily. 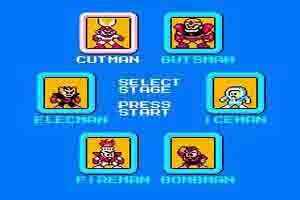 The original Mega Man has only 10 stages in the game (the 6 robot stages and 4 Dr. Wily stages). Here's my drawing of Mega Man! What are those funny numbers? Perhaps the biggest difference on the first game unlike other 5 Mega Man NES sequels, is that this game has a score keeper, so if ever get bored by finishing the game you can see if you can beat your last score. If you never played this game before than I should warn you that's very hard compared to others of the popular series. First there are no passwords or in game cheat codes (but there is a little glitch.......) to help you here so you have to finish the whole game in one sitting. Secondly, some of the game's jumps and bosses are fairly tough like the The Giant Mudman of the first Dr. Wily stage will give anybody a instant headache despite how cool he looks. It's weird that this is the only the Mega Man that has only 6 robots and you can also use the Select button to Pause. The graphics are sure better than most of the NES games of the late 80's. The game's looks are a strange mixture of Super Mario Brothers means the old Anime cartoon Astro Boy but that's not really a bad thing. The whole cartoony/sci fi style really works well here and your enemies also look fairly unique too like that annoying Big Eye robot that tries to crush you, to the little flying beanies that attack in packs. Sure the backgrounds are a little plain but at least it has backgrounds. Mega Man is also one of the first characters I know to have any type of stand still animation (he blinks if you leave him alone). The music like the graphics are fairly memorable. There are over 10 different soundtracks in the game and each robot stage has it's own theme music. Who can forget the fast paced track in the Cut Man stage or the strangely clam music of the Dr. Wily stages. I also love the sound effects especially all the different weapon noises. He's not just a man, he's MEGA MAN! Despite the hard difficulty it really never seems impossible and the game drives you to play and try again plus the music is unforgettable and the graphics are very stylist, perfect for the game. 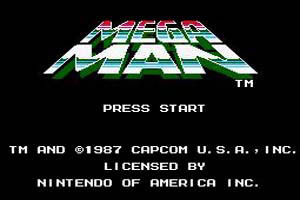 Mega Man was so good that there are now over 40 games based on the this popular series complete with many spin offs, toy products, and even a cartoon show, but we still can't forget the original that everybody fell in love with in the first place. The first Mega Man is a must for any die hard NES fan or any Video game fan for that matter as well.